I’ve always been fond of mathematics. For a couple of years I searched for good popularization books but generally ran to the same experience: these books would have lots of multicolor pictures of fractals, or deal with cool-sounding topics such as chaos, but would not reproduce the mindset of the mathematician, which is achieved after many exercises with arithmetic, calculus, geometry, logic or theorem proving. Through some twists of fate I’ve ended up getting into Computer Science, and I see some of the same problems here. Books popularizing Computer Science generally talk about artificial intelligence, Turing tests, artificial life or neural networks. These topics, however, occupy a tiny group of computer scientists (and attract a great deal of crackpots from many disciplines) and do not represent the basic mindset of the programmer. This essay is my attempt to explain how Computer Scientists think. So let’s begin with a problem. 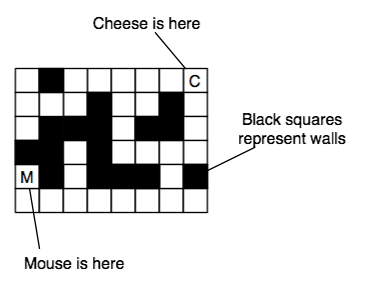 Imagine that you’re given a maze, in which there is a mouse and a piece of cheese, and you want the computer to find the shortest path the mouse can take to get to the cheese. Anyway, this takes us too far. It’s generally useful to think of data in the abstract rather than as a column of numbers. My purpose in showing this to you was to illustrate what programmers consciously or unconsciously take for granted: Anything can be represented on a computer. 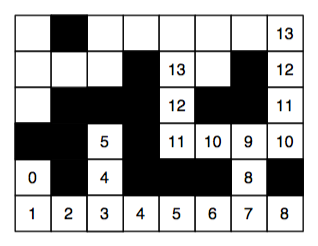 Everything can be expressed as a column of numbers. So let’s continue. To make things interesting, our mouse doesn’t move except when it’s given direct orders. 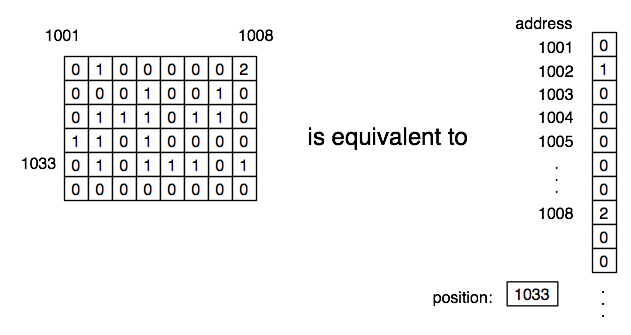 It can recognize only one order: MOVE, which can be up, down, left or right (like so: MOVE(up) ). Now you can start to move it. It would be easy, right? However, at this point we start to run into problems. Do we move the mouse up or right? 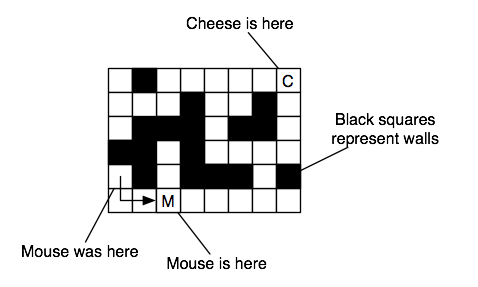 In this particular maze, it’s easy to see that the mouse needs to go right, but we could have substantially more complicated mazes, and we might not even know what the maze is going to be like. For instance, we could write a program that someone else will use on their maze. We need a general strategy. 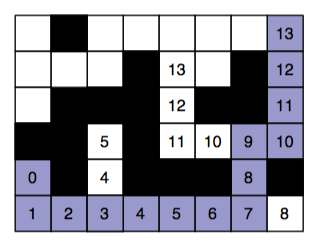 If you were solving this maze yourself, you’d probably trace the routes with a pen, and go back to the last fork in the maze when you run into a dead end. We can do better than that. Instead of following a route until we reach a dead end, with a computer we can follow several paths at the same time. How do we do that? With memory! To reiterate: we place a square on the queue, and assign it to be the top of the queue. Then we put its neighboring squares at the end of the queue, and we advance the top to the next square in the queue. We place its neighbors at the end of the queue, advance the top to the next square in the queue, and so on and so forth until we come to the square that contains the cheese. Kewl, I hear you say, but so what? Well, we’re in essence cloning the mouse into several little mice who each explore a path. It can be demonstrated mathematically that the first cloned mouse to find the cheese will have taken the least possible number of steps. Nifty, no? Just to make things a bit more clear, we’re going to add an extra refinement. When we add squares to the queue, we’re going to label them to indicate how many steps have been taken to reach them. This is pretty easy: for instance, if the top of the queue has a label of 5 , then when we add its neighbors we will label all of them with 6 . Place the initial mouse square on a queue. Label it with "0" and make this the top of the queue. Add to the end of the queue the possible continuations from the top square. Label them with one plus the label of the top of the queue. Advance the top of the queue to the next element in the queue. And that’s it for mice and cheese. 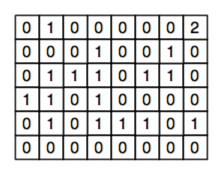 What you have just learned is one of the basic techniques of Computer Science, called Breadth-First Search . If you’ve gotten the hang of it with just one reading, pat yourself on the back. Hell, pat me on the back too. It’s one of the stumbling blocks for many beginners in CS, and it is at the base of many other techniques. Queues are in widespread use in computer programs. Take the ability to clone mice that the queue gave us. Think of operating systems like Windows or Mac, which give you the impression that the computer is doing several things at once, or that there are several little cloned machines, one for email, one for Word, etc. Well, queues are very important in simulating this multitasking ability. Just for the record, computers (unless they have dual processors) can do only one thing at a time, and that is simply to perform a calculation. Isn’t it wonderful that this seemingly terrible restriction has been so well tackled? To finish, I’d like to give you my favorite quote about Computer Science, by a famous dutch computer scientist named Edsger Dijkstra: The question of whether computers can think is like the questions of whether submarines can swim.